Revit Fix: Where are these Model Lines with the error? Where are these Model Lines with the error? You have been giving a Revit error warning yet you can’t find the element and Revit doesn’t give you the option of showing them. It’s worth remembering that you can draw area boundary lines in an Area plan view. Delete the Area plan view and the Area boundary lines still remain (you just can’t see them). 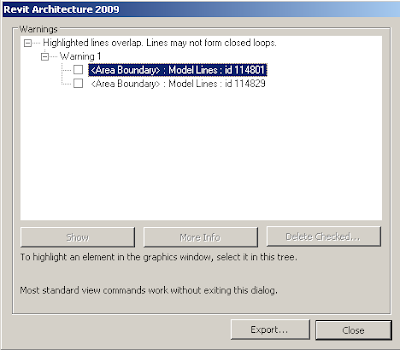 Revit considers Area Boundary lines as a type of model lines, but yet they are only visible in the specific type of Area plan they were created in. You could try recreating the area plan views but the easiest solution is just to delete them form the Warnings dialogue box. On a side note: For some reason when you export the warnings of Area Boundary lines to the html file the export only calls them model lines, eg Model Lines : id 116854. Some bug in the export, as the warning dialogue box clearly calls them area boundary : model lines. Have you ever found a fix for this? We just came across the issue and it drove us crazy for a few hours. Then we figured out what was going on. Is there any other way to "purge" area boundary lines?